Some quick measurements to help fellow CS27 owners... My boat has a 35' mast, lines led aft to the cockpit. 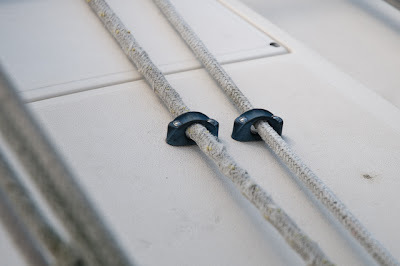 The goal is to be able to use the halyard to lift someone out of the water on a winch, and for all lines to be able to reach the rear of the cockpit; this give me length to allow all halyards to be used in place of a shroud in emergencies. Although I have a bunch of 1/2" lines, I feel like they are really overkill, and not the best fit in the clam-cleats. They are also a bit large for the regular cleats. After consulting with Rigging Only, the recommendation was to go to 3/8" lines, which saves some money. Rigging Only has given me great advice and service in the past, so I will continue to trust their advice. 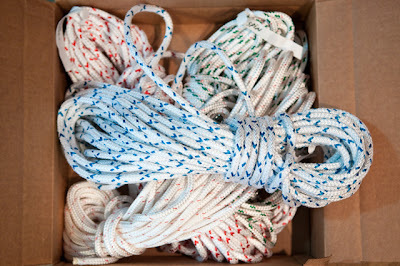 I have settled on Sta-Set-X for the main and jib halyard, and regular Sta-Set for the spinnaker halyard and topping lift. I can't wait to get the new lines reaved as the old ones were a nasty moldy gray and very stiff from UV damage. Nice new lines will really dress the boat up and improve the feel. Opening the box from Rigging Only was like opening a Christmas present. I still need to get a new set of jib sheets, but those aren't in quite as bad a condition, so less critical. I'm going to retain the 1/2" size I currently have as it has a good feel despite being oversize. One change I intend to make is to do away with the shackle and go with bowlines to attach them to the clue. Less banging around is good, and it will allow me to end-for-end them when they start to wear. At this point I'm looking at Cajun Ropes XLE and New England Ropes Sta-Set as possibilities.